NEW YORK -- Helping kids make healthy food choices is a challenge, especially during back-to-school time. It's natural to seek the most convenient options for the sake of saving time and sanity. But with a little extra help, the convenient options can actually be healthier. 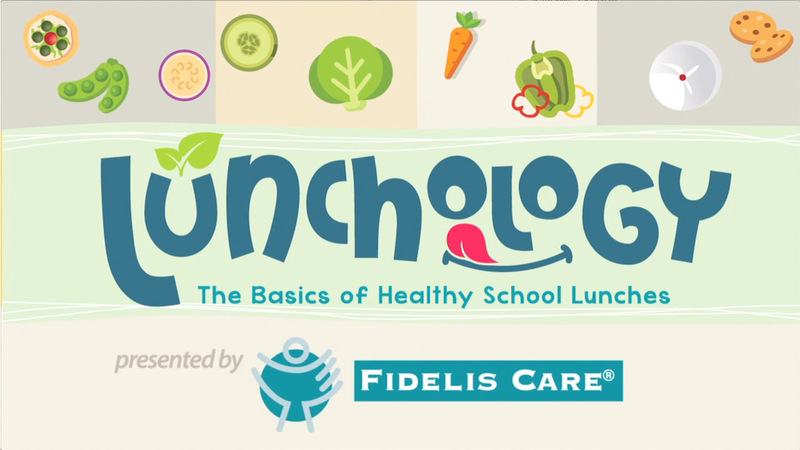 In partnership with lifestyle expert Evette Rios, Fidelis Care is offering that extra help through our new initiative, Lunchology: The Basics of Healthy School Lunches. With Evette's healthier, kid-approved school lunch alternatives, Lunchology will teach the basics of better food choices, at the school lunch table and beyond. (1,500 - 2,3000 mg per day). In addition, kids often don't eat the right amounts of fruits, vegetables and whole grains each day to reap nutritional benefits that especially come in handy at school, like sharper mental focus and increased energy. And as many parents can attest, kids can be picky eaters, which means the pressure is on to creatively transform healthy alternatives into food the kids will actually want to eat. Lunchology aims to help by providing parents with unique, affordable school lunch ideas that put healthier twists on classic kid fare without too much preparation or stress. To download the full menu planner, and access more of Evette Rios' unique school lunch ideas, visit fideliscare.org/Lunchology. "Lunchology: The Basics of Healthy School Lunches," is an initiative designed to take the stress out of healthy school lunch planning. Helping kids make healthier food choices is definitely a challenge, especially at the school lunch table. For that reason, Fidelis Care has partnered with lifestyle expert Evette Rios to help parents score healthier victories at the school lunch table. "Lunchology: The Basics of Healthy School Lunches," is an initiative designed to take the stress out of healthy school lunch planning, and offer parents tips and tricks to easily create school lunches kids will actually eat without sacrificing taste, convenience, or budget. Equipped with Lunchology's pre-planning strategies, healthy, affordable, stress-free school lunches can always be on the menu! Create a lunch drawer. Fill it with bags of pre-measured snacks bought in bulk, like Cheerios, crackers, nuts, and dried fruit. Freeze yogurt tubes. They make great small ice packs and typically thaw by lunch time. Make your own dried fruit. Kids love the tarty sweetness of dried fruit! For example: slice strawberries and bake low and slow at 210 degrees for three hours. Always include a water bottle in your child's lunch to help them stay full and hydrated. Drop some sliced fruit inside for a little extra flavor to keep things interesting! 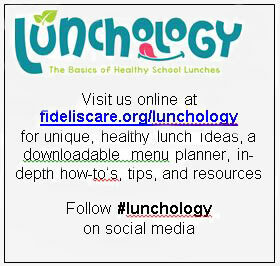 Parents can find these tips, along with an exclusive menu planner, shopping list, and healthy school lunch resources, online at fideliscare.org/lunchology, and can follow along for more ideas on social media using #lunchology.